Since support for C++11 allocators isn’t universal yet there’s a bit of old boilerplate in there, but overall it’s still pretty compact. To see how it works let’s look at the deallocate function first: Whenever there’s a large block of memory, I just call regular operator delete. Small blocks of memory go into the available list. The allocate function matches this: Large blocks of memory come from operator new, small blocks come from the available list. When the available list is empty, a new chunk of memory is allocated and all new objects from that chunk get added to the available list. Should be pretty straight forward. 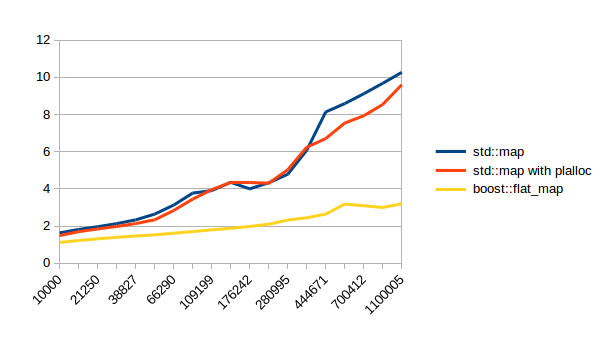 The benefit of this is that the memory from one container gets allocated mostly contiguously. It only makes sense for node based containers though since it falls back to regular operator new and operator delete for large blocks of memory. One thing that’s a bit ironic is that the only container that fully supports stateful allocators, boost::unordered_map, actually asserts when it tries to move plalloc. The assert comes from a sequence where it does “this->alloc = std::move(other.alloc); ASSERT(this->alloc == other.alloc);” which will always be false for stateful allocators. I consider this a defect in boost::unordered_map and will file a bug for it. In all of these the x axis is the number of items in the container. 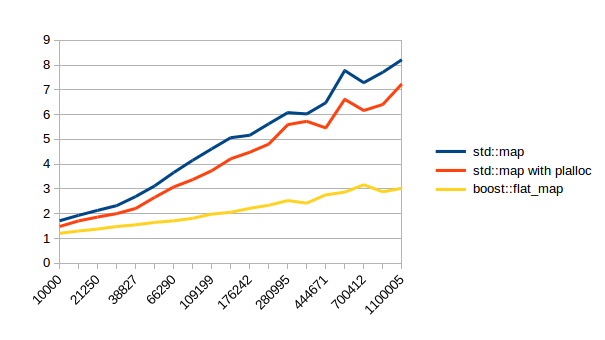 The y axis doesn’t mean much except to compare relative numbers. Lower numbers are faster. I used maps from int to pair<string, string>. 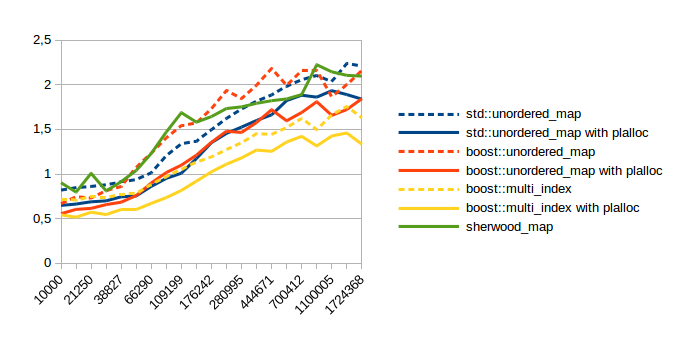 There’s no graph for sherwood_map with plalloc because it doesn’t make any sense. 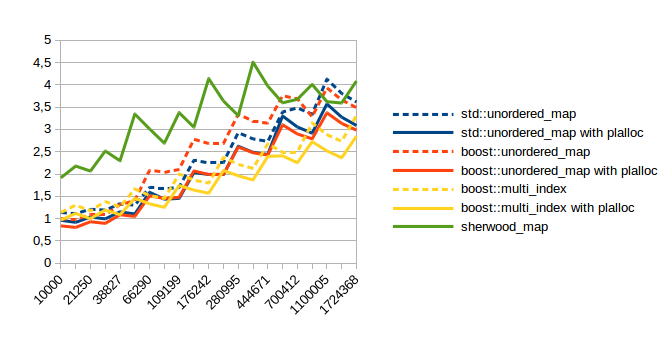 For sherwood_map plalloc would just be a slower version of std::allocator because sherwood_map is not node based. 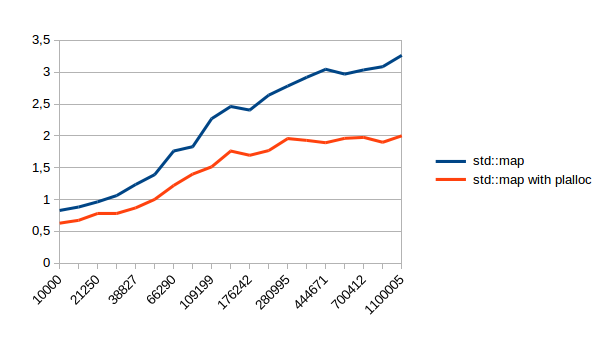 The average speed up for successful lookup is 16.8%, and the average speed up for unsuccessful lookup is 6.7%. 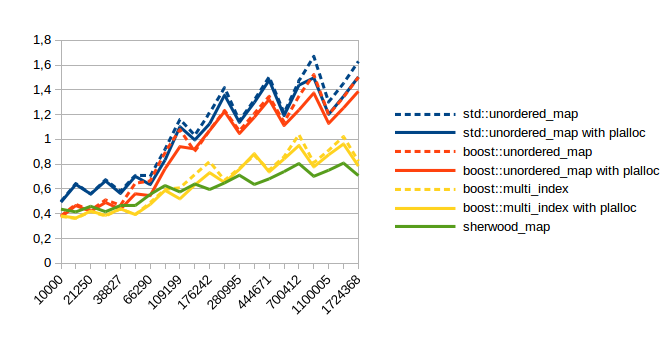 A few notes about this: boost::flat_map is still much faster. I didn’t try to find out why this is exactly, but my assumption would be that the processor can predict more than jump ahead of time because it doesn’t have to finish fetching the old memory before it knows where the next jump could go to. 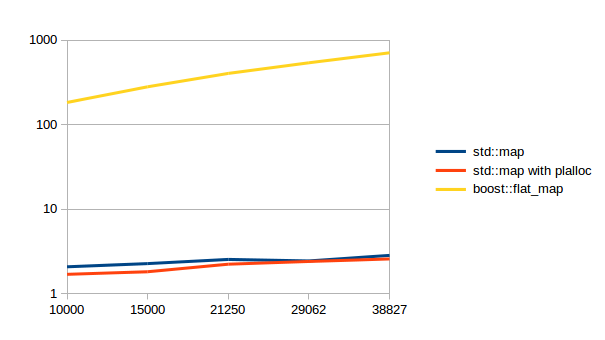 I had to make the insert graph be log scale because it’s very slow to insert random values into boost::flat_map. (and Libre Office doesn’t seem to have a way to split an axis) That’s not a problem with the container though, it just shows that you shouldn’t do this. (and it’s not fair to profile the container for something that you shouldn’t do) I left boost::flat_map out of the erase graph because of this. That dent in the unsuccessful lookup is weird. At first I thought it was a measuring error, but it is repeatable. Finding out what it is would take too long though, so It’ll just stay an unsolved mystery. I wouldn’t expect to find this on all machines. On the other hand whatever method that you were going to use instead of a node based container probably has these same downsides. You can probably use plalloc even if your container doesn’t fully support stateful allocators. Just be careful about copying or moving the containers. I can’t predict what behavior you’d get. I wouldn’t consider the assert() inside Boost to be a bug. Actually, stateful allocators can only compare equal if they can deallocate each other’s memory. In particular, copies of allocators need to compare equal. For that to happen, you need an extra level of indirection in which you put the storage outside the allocator, and use a reference/pointer inside the allocator to that storage. The operator== then simply compares these pointers. It is a bit ugly but it’s the only way to have a C++11 conforming stateful allocator. The problem with putting the storage outside of the allocator is that then two allocators could be referencing the same storage. At which point I require synchronization between the allocators or else I’d run into threading problems. I’d also make my nice cache behavior much weaker because now content from two different containers could be allocated next to each other. My allocator is not exactly C++11 standard compliant, but not actually when it comes to move assignment. My move assignment is standard compliant because the standard simply states that the postcondition of “X a1 = move(a);” is that a1 equals the prior value of a. It does not have to equal the value of a after the move, but boost currently asserts that. Hi, could you give an example how to use your allocator with an unordered_set? Let’s hope that the blogging software doesn’t eat my angle brackets.